Give a gift that's a blessing with this custom religious pen set. 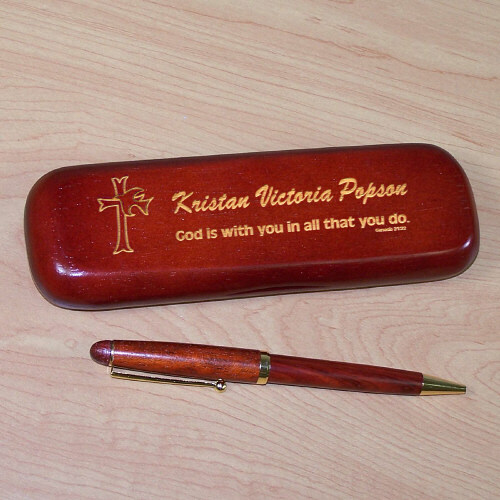 This quality Rosewood pen and matching case makes a great Confirmation gift! Your engraved Confirmation pen set includes a classy pen case that features a sacramental symbol and an inspiring Bible quote, and it will be personalized with any name, up to 30 characters. The Rosewood pen measures 6" in length, writes in black ink (uses a Parker refill) and features twist-action ballpoint operation. It was a Confirmation gift and our Grandson loved it! I ordered this for my 15 year old son's confirmation. It is very attractive, he says he'll put it on his desk at home to do homework. It's nice.